This is an all original 34mm. 1971 OMEGA GENEVE with a manual winding caliber 601 (just cleaned) gleaming movement having two adjustments. 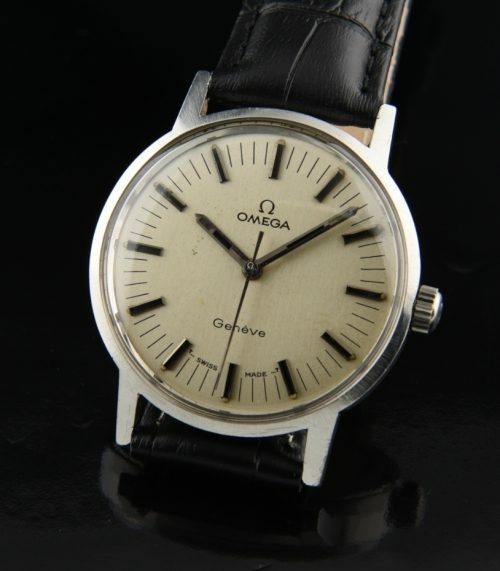 The crystal, crown, dial, hands and case are ALL original OMEGA. I really love the sporty look of the interesting black inlaid hands and matching baton markers. Notice the extended seconds markers-adding further interest to the dial. There are only small age marks which appear much less visible with the naked eye on this fine dial.